Can You Sue The Good Samaritan? There is a cynical expression that states: No good deed goes unpunished. Fortunately, thanks to Good Samaritan laws, good deeds done in emergency situations are rarely punishable. In all Canadian provinces except Quebec, bystanders are not legally obligated to help in an emergency. However, if you do decide to step in and something goes wrong, you will not be held liable. 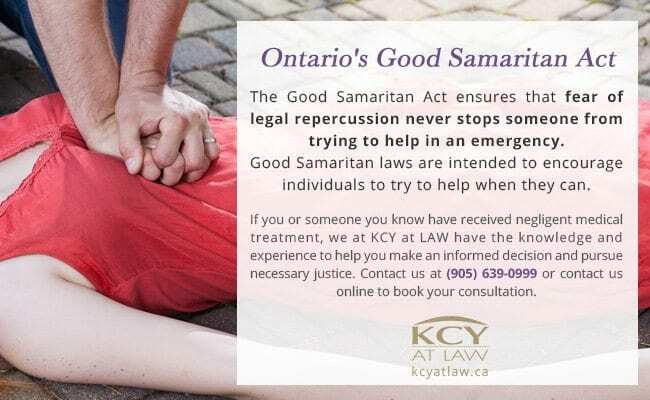 Ontario’s Good Samaritan Act protects a rescuer from any liability should they attempt to help a victim in distress. If you find yourself witnessing an emergency situation unfold, you might question your ability to help in the given circumstances and wonder if you will face punitive action should you make a mistake under stress. The Good Samaritan Act ensures that fear of legal repercussion never stops someone from trying to help in an emergency. Good Samaritan laws are intended to encourage individuals to try to help when they can. This act also applies to off-duty physicians. For example, if you are walking down the street and are involved in a motor vehicle accident and a passing doctor stops to help you, they cannot usually be sued for malpractice. A physician who voluntarily performs emergency treatment or first aid outside of a hospital is rarely accountable for damages as it is very rare for a doctor to fall below an expected standard of care in the event of an emergency without access to medical tools and resources. Only if a physician’s act or omission in an emergency situation outside of a hospital causes further injury compared to another physician of typical experience in the given situation would it be possible to sue them for Gross Negligence. That is, breaking a rib while performing CPR is fine, improvising a surgery is probably not. Additionally, injuring someone else in the process of providing help could possibly be seen as grossly negligent. The Good Samaritan Act is not a carte blanche for reckless behaviour. 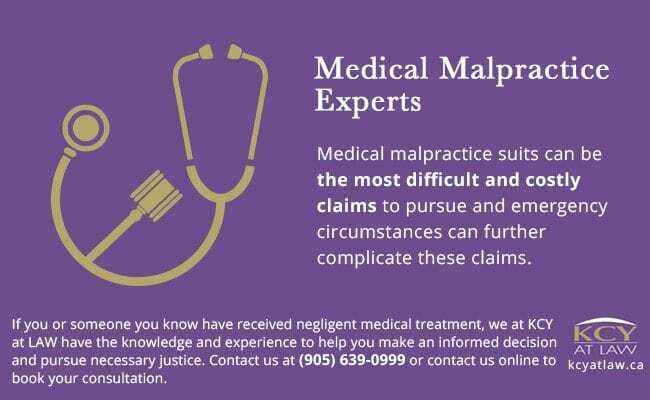 Medical malpractice suits can be the most difficult and costly claims to pursue and emergency circumstances can further complicate these claims. 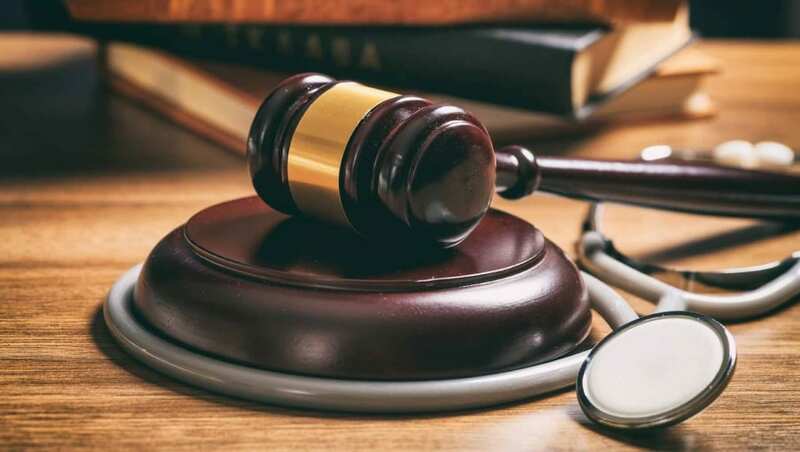 If you or someone you know have received negligent medical treatment, we at KCY at LAW have the knowledge and experience to help you make an informed decision and pursue necessary justice. Contact us at (905) 639-0999 or write us online to book your consultation. 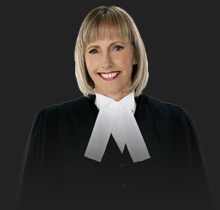 https://www.kcyatlaw.ca/wp-content/uploads/2016/10/Can-You-Sue-The-Good-Samaritan.jpg 1017 1800 Kathy Chittley-Young https://www.kcyatlaw.ca/wp-content/uploads/2018/01/KCY-at-LAW.svg Kathy Chittley-Young2016-10-21 10:01:572019-02-05 01:30:23Can You Sue The Good Samaritan?